A disgruntled customer from Lisburn allegedly locked staff into a printing shop and threatened to burn it down in a dispute over a dressing gown, the High Court has heard. Prosecutors claimed employees at the business in Belfast city centre were left terrified by Gary Byrne’s actions. The 29-year-old is also accused of attacking up to four police officers after they were called to the scene earlier this month. 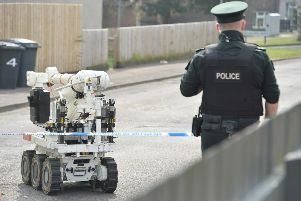 Byrne, of Hawtree Park in Lisburn, County Antrim, faces charges of false imprisonment, threats to kill and threats to damage property, disorderly behaviour, four assaults on police and criminal damage to a PSNI cell smeared in excrement. During a bail application it was claimed he went into Dstar Printing Boutique on Castle Street on June 7 demanding to speak to the manager. The premises were locked for a period with three members of staff still inside, the court was told. “They all appeared to be terrified as he appeared to be completely out of control,” the prosecutor added. Bryne allegedly continued by telling staff there were three ways to sort out the situation: the right way, the wrong way or the illegal way. He then unlocked the shop, approached police outside and asked: “Are youse looking for me?”, the court heard. Officers were forced to put him into leg restraints and handcuffs amid fears he was going to strike out, it was claimed. Byrne is accused of threatening to bite one constable and kicking two others. Mr Justice Horner also heard that after Byrne was brought into custody he allegedly daubed excrement on a cell wall and wrote the word “Dirty” on it. Adjourning the application for bail, the judge stressed that he would not consider releasing Byrne without seeing a psychiatric report.